New Zealand weddings planner specialising in arranging weddings in New Zealand for couples from around the globe. We will take care of every detail, creating the New Zealand wedding of your dreams, leaving you relaxed to enjoy every magical moment. Accommodation in Marlborough New Zealand (NZ), use our map & route planner to find budget to luxury lodge accommodation. Indulge your senses in Hawkes Bay, Martinborough, and Marlborough. Discover vintner and culinary secrets. Marlborough Sounds Adventure Company specialises in guided and independent sea kayaking, walking, hiking and mountain biking holiday tours of the Queen Charlotte Track and the Marlborough Sounds. Lets Go New Zealand offers New Zealand tours, tourist attractions, travel & vacation packages, accommodation, car rentals and motor home hire. Let's Go! - Discovery holidays with a difference. When you are planning your New Zealand vacation let a New Zealand travel agent assist you with your New Zealand holiday. Acrossnz offers an online personalized itinerary planning and reservation service, where you receive a totally customised New Zealand itinerary. Luxury tour operator offering guided vacation/holiday package deals for adventure travel in both the North and South Islands of New Zealand. We offer exclusive escorted trips and the chance to see an abundance of New Zealand nature and wildlife. Door to door shuttle services within the Marlborough region. Blenheim Airport transfers to Picton accommodation/water taxis. Picton Ferry transfers. Picton, Marlborough New Zealand visitor information. Picton Motel accommodation bookings, rental cars, Interislander Ferry and TranzCoastal Train tickets. Find activities in the Marlborough Sounds, sea kayaking, guided walks on the Queen Charlotte Track. The largest travel directory & tourism industry resource. 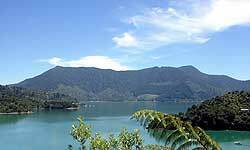 Sounds Great Holiday Homes - On-line listings for holiday rental accommodation in the peaceful Marlborough Sounds, NZ. Sounds Great will take the worry out of your holiday arrangements! Sounds Holiday offers an absolutely beautiful beach front self-contained, secluded holiday home for rent. Nestled at the head of Queen Charlotte Sound in the beautiful Marlborough Sounds, Picton is possibly New Zealand's most pretty seaside town. Boasting one fifth of New Zealand’s coastline at its door and the best climate in New Zealand, rockets this charming little fishing village into a world class destination for international and domestic visitors to Marlborough.